In a time where we’re texting more than ever, it is vital that consumers have that ability with your business, too. When was the last time you sent a text message? Well, if you’re like the average American, it was probably within the past twenty-four hours, since Pew Internet reports that 97% of Americans text at least once a day. With how much we all seem to have our smartphone attached at our hip, why wouldn’t your business want to take advantage of achieving and retaining more customers through this device that seemingly runs our lives? Although we mostly text for personal reasons, there are ways for businesses to also use this form of communication to increase business performance and profit. Hopefully, you already have an appointment reminder system in place, but think of how much more efficiently and cost-effectively your business can run with automatic text appointment reminders for clients. Text reminders can free up time for call takers who usually have to dial numerous outbound calls and talk to or leave voicemails for your customers to focus on other tasks. When text messages have an almost 100 percent open rate, you are more likely to ensure that your customer got your reminder rather than wondering if that voicemail you left will just be another unopened notification on their smartphone. But texting appointment reminders aren’t the only way to ensure that you have more customers showing up for a booked appointment. With text-enabled numbers, it makes it easier than ever to start a text campaign for your dealership. Have a list of past customers who have booked with you but haven’t seen in a while? Direct mail pieces may work, but what about a text campaign with a reminder or offer for those customers to use your business again? Email and direct mail aren’t exactly a thing of the past (yet), but text messaging could be one of your most successful future campaigns. With a 111% growth in SMS usage in 2016 as reported by Salesforce, a majority of marketers use mobile and SMS marketing channels to engage customers. They’ve also reported that 77% of marketing leaders say that mobile marketing (including SMS, push notifications, mobile apps, and other) generates ROI for their company – compared to 31% in 2015. With those kinds of statistics, what’s stopping you from developing your own SMS campaigns? Think about how many times you’ve called a business just to be placed on hold or put in a queue for the next available representative. What if you could contact that business by texting them instead to ask your simple question? Which would you prefer? Well, a study shows that over half of consumers would prefer texting over a phone call for reaching customer support. We all lead busy lives, and according to many statistics, our attention spans are becoming shorter than ever – so why not make it easier for your busy customers or leads to reach you via SMS? Ready to start using text-enabled numbers for your business? 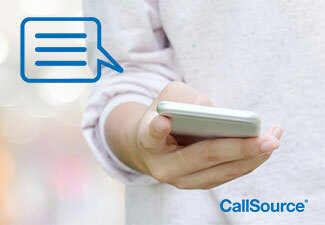 Contact a CallSource representative today to get your numbers and start texting!